If you distilled Christian doctrine to its essence you would be left with three fundamental factors: Salvation, Sanctification, and Glory to God. Sanctification is the bridge between salvation and glory to God making it the crucial component of Christian living, the essential process upon which all spiritual growth depends. It is essential to understand the distinction between the two aspects of sanctification. First in the “positional sense” that is, consecrated, set apart, made holy for God’s glory. This aspect relates to the supernatural outcome of the “second birth” … when we were “…baptized into one body” spiritually placed “in Christ” (1 Cor. 12:13). “…sanctified in Christ Jesus.” (1 Cor.1:2). “And such were some of you: but ye are washed, but ye are sanctified, but ye are justified in the name of the Lord Jesus, and by the Spirit of our God.” (1 Cor. 6:11). At this one-time event, our spirit is permanently united to God’s Spirit “…he that is joined unto the Lord is one spirit (1 Cor. 6:17). This constitutes our standing or position…what we get from God when we repent and trust Christ. Then begins the second stage. Sanctification in “practical sense” (our “walk”). The trying lifelong process whereby the “new creature” (2 Cor. 5:17) learns, through trial and error, victory and defeat, obedience and disobedience, to “…walk in newness of life” (Rom.6:4). A gradual transformation (a turning from sin) which causes that which happened on the inside to become evident on the outside. “Nevertheless the foundation of God standeth sure, having this seal, The Lord knoweth them that are his. And, Let every one that nameth the name of Christ DEPART FROM INIQUITY. But in a great house there are not only vessels of gold and of silver, but also of wood and of earth; and some to honour, and some to dishonour. If a man therefore purge himself from these, he shall be a vessel unto honour, SANCTIFIED, and meet [fit] for the master’s use, and prepared unto every good work. Flee also youthful lusts: but follow righteousness, faith, charity, peace, with them that call on the Lord out of a pure heart.” (2 Tim. 2:19-22) [Emphasis mine]. Also consider: (Rom. 6:1-13, 2 Cor.6:14-17, 7:1). The believer’s “practical sanctification” should be born out of a desire to live in such a way that pleases and glorifies God. It involves gradually learning to manifest the personal holiness called for in (1Peter 1:15-16, and 2 Cor.7:1) which can only be accomplished by yielding to “…the power that worketh in us. “(Eph.3:20). However, as we shall see, living a righteous life separate from the sins of this “present evil world” is not something we can accomplish in our own strength. Sanctification is God’s will for every one of His children, “For ye know what commandments we gave you by the Lord Jesus. For this is the will of God, even your sanctification…That every one of you should know how to possess his vessel in sanctification and honour…”(1Thess.4:2-4). “…come out from among them, and be ye separate, saith the Lord…” (2 Cor.6:14). “Nevertheless the foundation of God standeth sure, having this seal, The Lord knoweth them that are his, And, Let everyone that nameth the name of Christ depart from iniquity. But in a great house there are not only vessels of gold and of silver, but also of wood and of earth; and some to honour, and some to dishonour. If a man therefore purge himself from these, he shall be a vessel unto honour, SANCTIFIED, and meet [fit] for the master’s use, and prepared unto every good work.” (2 Tim.2:19-21) [Emphasis mine]. “Who gave himself for us, that he might redeem us from all iniquity, and purify unto himself a peculiar people, zealous of good works.” (Titus 2:14). Compare, (Ex.19:5 & 1Peter 2:9). “…a peculiar people: that ye should shew forth” proclaim God’s glory, both with our lips and our lives! 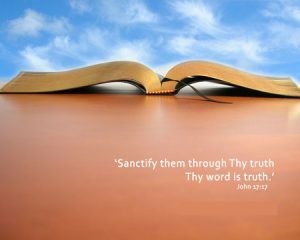 “And for their sakes I sanctify myself, that they also might be sanctified through the truth.”(Jn.17:19) “…thy word is truth” v.# 17 Compare, (Eph.5:26, John 15:3). Discipleship No discussion of the “sanctification process” would be complete without mentioning the importance of “one on one discipleship.” Discipleship is the God-ordained means by which new believers are taught, through personal instruction and example, to “walk in newness of life”. Sanctification requires biblical knowledge coupled with spiritual understanding (which together equal wisdom); personal discipleship plays a vital role in the process. The new believer must have a mentor to model a changed life. Spiritual growth is all about CHANGE; transformation brought about by a refining process designed to purge the dross of sin and self, gradually conforming us to the image of Christ; rendering us, “sanctified, and fit for the masters use, and prepared unto every good work.” (2 Tim.2:21). This growth process involves a continual dying to self-life (2 Cor.4:10-12 & 5:14-15). Of course, the Lord Jesus is our primary example of a self-less life; however, having personal examples of this principle is essential for growth. When Jesus said “follow me” (Luke 9:23) where was He going? Follow Him where? Follow Him to Calvary; to the cross which is an instrument of death; the death of self-life. The goal is to make us, “conformable unto his death” (Phil.3:10). “He must increase, but I must decrease.” (John 3:30). Jesus sacrificed His life to give us life…now, out of love and gratitude, He wants us to yield control of our lives to Him, learn to defer to His will so that He can live His life through us to reach others with His love. The primary goal of sanctification, on a spiritual level, is to bring glory to God. On a personal level, the objective is to learn that we are no longer our own (1 Cor. 6:19-20). We “are bought with a price…” We belong to the Lord; we are saved to serve the One who paid the price. The ongoing lesson is to yield control of our lives to God. If you are saved you are a child of God: “For ye are all the children of God by faith in Jesus Christ.” (Gal.3:26). “Train up a child…” One of the first things a child must be taught is he or she is not in control; boundaries must be established. It is the parent’s responsibility to prevent the child from being overtaken and controlled by the inherited, rebellious sin nature. (the first word a child learns is NO). When boundaries are set and enforced with consistency the result will be security and stability; boundaries provide order in a child’s life (James 1:8); peace and joy in the parent’s life, (Prov.22:6). True love sets boundaries and true happiness is to be content living within the boundaries of that love. “Foolishness is bound in the heart of a child; but the rod of correction shall drive it far from him.” (Prov.22:15). Insight as to the fruit of “foolishness” is found in (Prov.19:3). If the inherent foolishness is not dealt with it will carry over into adulthood; resulting in great loss! “The rod and reproof give wisdom: but a child left to himself bringeth his mother to shame.” (Prov.29:15). [Emphasis mine]. “…left to himself” means his rebellious self-will has never been dealt with, never shown where or what the boundaries are, or the consequences of disobedience. This inherent tendency to disobey must be broken…the sooner the better “betimes” [early on] (Prov.13:24). This truth not only applies to our children but also to our relationship with our heavenly Father. That there are unmistakable parallels regarding Biblical wisdom concerning physical parenting and God’s dealings with us, should be apparent. As the child must learn, through repeated correction, to submit to the parent’s will, so must we painfully learn that we are not in charge; as blood-bought children of God we must cease attempting to control our lives. Just as the young child, for his own good, must learn to live within certain boundaries, the same holds true of us. 4. “Ye have not yet resisted unto blood, striving against sin. “The LORD will perfect that which concerneth me…” (Ps.138:8). The process of sanctification is multifaceted. The Bible contains many key doctrines, which (when applied,) play vital roles in the process of sanctification. Fundamental teachings which are to the essential transformation called for in (Rom.12:1-2); principles which influence every area of our lives (spirit, soul, and body). These numerous teachings all work together toward the same goals; instructing the believer concerning the necessity of dying to self-life and yielding daily to the indwelling Holy Spirit; allowing Him to expose those things which hinder our relationship with the Lord. Learning to identify “strongholds” both the obvious and the subtle. A problem recognized can be a problem solved. “For though we walk in the flesh, we do not war after the flesh: (For the weapons of our warfare are not carnal, but mighty through God to the pulling down of strongholds;)…” (2 Cor.10:4). Prior to salvation, we lived, “according to the course of this world, according to the prince of the power of the air, the spirit that now worketh in the children of disobedience…”(Eph.2:2). During that time we formed an unbiblical mindset. Strongholds are corrupt concepts and beliefs that have taken root in the mind, resulting in ungodly thought patterns, which in turn cause a distorted perception of both physical and spiritual reality. This accounts for the strong exhortation to all born-again believers found in, (2 Cor.10:4-5). Prior to salvation the insidious influence of an ungodly society, along with unbiblical religious teaching and traditions, had thoroughly shaped our lives; our way of thinking. These sinful thought patterns were ingrained in our mind over the years as strongholds. The sobering reality is that the deformities of sin continue to mar the soul long after salvation. Strongholds must be pulled down and replaced. Strongholds, whether they are from the past or present must be recognized, pulled down and replaced with God’s truth; if not they will eventually destroy you. The account of the unclean spirit (Matt.12:43-45) having gone out of a man and later returning along with seven other wicked spirits upon finding the house empty illustrates it isn’t enough to cast down imaginations and bring into captivity every thought to the obedience of Christ; something must fill the void. Before we can “put on” Christ (Rom.13:14) we must first “put off” something. Consider, (Eph.4:22-32 & Col.3:8-12). Desire and Affections are things of the Heart. “For where your treasure is, there will your heart be also.” (Matt.6:21). “Set your affection on things above, not on things on the earth.” (Col.3:1-7). Spiritual realities [understanding] (Col.1:9) enter the mind through the door of a sincere, truth-seeking heart, which desires to please and glorify God. Our “affection” needs to be reoriented. Every natural desire and ambition springs from self-life, therefore in order for spiritual growth to take place, our desires MUST be brought under the control of the Holy Spirit. A wise man evaluates his desires in relation to eternity. Again, having information about Christ’s life revealed to us is not enough…genuine Christianity is having the life of Christ FORMED IN US, “…conformed to the image of his Son, that he might be the firstborn among many brethren.” (Rom.8:29). Also consider, (Eph.4:13, 15) and Gal.1:16 & 4:19). “…be not conformed to this world: but be ye transformed by the renewing of your mind…” (Rom.12:1-2) [Emphasis mine]. Prior to salvation, we were conformed to this “present evil world” it is now necessary to allow God to renew our minds. This is accomplished by INTERNALIZING HIS WORD, so as to let it dominate our thought life, CONFORMING us to His way of thinking so that we can live in accordance with His heart and mind. Remember, the mind is the battlefield! “For my thoughts are not your thoughts, neither are your ways my ways, saith the LORD. For as the heavens are higher than the earth, so are my ways higher than your ways, and my thoughts than your thoughts.” (Isa.55:8-9). “I have spread out my hands all the day unto a rebellious people, which walketh in a way that was not good, after their OWN THOUGHTS.” (Isa.65:2). [All emphasis mine]. “Hear, O earth: behold, I will bring evil upon this people, even the fruit of THEIR THOUGHTS, because they have NOT HEARKENED UNTO MY WORDS, nor to my law, but rejected it.” (Jer.6:19). Also see, (Jer.7:23-24). “I thought on my ways, and turned my feet unto thy testimonies.”(Ps.119:59). It shouldn’t be hard to see the pivotal role of God’s word in our lives; for this very purpose we are commanded, “Let the word of Christ dwell in you richly…” (Col. 3:16). This is the means of CONFORMITY by which we reform our thought process, the way we reshape our worldview so that it conforms to God’s view. “Let this mind be in you…” (Phil.2:5). Also consider, (Phil.4:8-9). For this reason cultivation of a personal relationship with Christ is one of the crucial components of sanctification. “Abide in me, and I in you.” (John 15:4), “That I may know him…” (Phil. 3:10), “Draw nigh unto God, and he will draw nigh to you…” (James 4:8). Consider the profound effect a daily intake of God’s word can have on our lives; the beneficial influence of an ongoing relationship with God and His word. Consider, (Prov.6:20-24) “lead thee”, even in your sleep it will “keep thee” during the day it will, “talk with thee”, provide “light” for guidance and correction “keep thee” from evil temptations. Point is, if you yield to it, God’s word will transform your life; gradually conforming you to Christ. As the saying goes, “you are what you eat”, the same is true concerning our mental consumption of God’s word. “Man shall not live by bread alone, but every word that proceedeth out of the mouth of God.” (Matt.4:4). Saturate your mind with His word until it permeates your whole being…until your thoughts, actions, and reactions reflect His… “grow up into him [Christ] in all things…” (Eph. 4:15); another way of saying “…put ye on the Lord Jesus Christ” (Rom.13:14). Sanctification through the word and the Holy Spirit is the HOW to “…put ye on the Lord Jesus Christ, and make no provision for the flesh, to fulfil the lust thereof.” (Rom.13:14). To be filled with the word of God is to be filled with the Spirit of God; compare (Eph.5:18-21 with Col.3:16-17). The two are inseparable…functioning in perfect unison, like electricity (Spirit) flowing through the filament (word) of a light bulb producing light in the process. “…in thy light shall we see light” (Ps.36:9). They operate so closely that the word of God is referred to as, “the sword of the Spirit…” (Eph.6:17). “But your iniquities have separated between you and your God, and your sins have hid his face from you, that he will not hear.”(Isa.59:2). The so-called “major sins” such as adultery, cheating, lusting, stealing, etc. are the obvious obstacles…while the rationalization of our so-called “little sins” or “natural flaws” is subtle. Failure to recognize and acknowledge all forms of sin for what they are, a type of SELF-DECEPTION: Refusal to agree with God’s pronouncement that, “whatsoever is not of faith is sin.”(Rom.14:23) is to, “…give place to the devil.”(Eph.4:27). These are not just character flaws or negative personality traits (as we prefer to call them), they are SIN! These are the hidden sins which secretly grieve and quench the Holy Spirit, breaking fellowship with the Lord; thereby stifling sanctification.